One of the biggest challenges that entrepreneurs face is securing capital for their business. Financial institutions may require a good credit score that new businesses may not yet have as they are becoming established. Entrepreneurs have the option of getting their capital from investors, but that often means they would have to give up equity in their company. While some new business owners are okay doing that, others search for varied options to avoid giving up the equity in their company they’ve worked so hard for. A better option with no loss of ownership rights exists for many small and mid-sized businesses, it is called purchase order financing. Entrepreneurs do not have to worry about a good credit rating or losing equity. 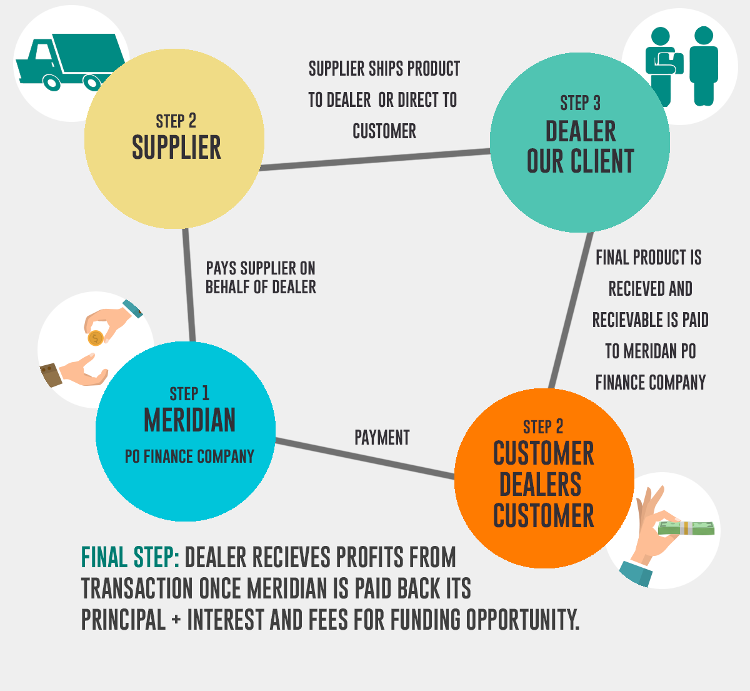 Companies like Meridian PO Finance offer purchase order financing which makes fulfilling your obligations to customers and suppliers easier and more effective. How does it work? Here are a few things to know about the process of Purchase Order Financing and what to expect. PO financing involves the finance company paying the supplier for goods that have been ordered to fulfill customer orders. It is easier to qualify for this type of financing rather than the typical bank financing. Meridian PO Finance company will review the credit rating of the client who started the purchase order and provides up to 100% financing. The funding cycle begins when the borrower obtains a purchase order from a client who has received goods or services from the business. Even though the borrower does not need to have a good credit rating, the lender will need to ascertain that the customers who have ordered goods have been credit approved. If the borrower has a client who is credit approved, he can present copies of supply and customer purchase order to Meridian PO Finance. Meridian PO Finance will then evaluate and assess the viability of the client’s/borrower’s application. There are several aspects of the business that need to be reviewed. The most critical aspect is the customer’s credit rating. However, the lender also needs to determine if the suppliers can deliver the quantity and quality required. They will also want to know that your company is credible and capable of meeting the obligations it has to its customers. These considerations are important because they help the lender manage risks and avoid issues in the future. Once Meridian has verified and established the viability of the applications, documentation will be provided to the client and the supplier of goods. When the process of verification with the supplier and the client is complete, Meridian will pay the supplier based on the supplier’s term. Depending on the terms, that can either be a letter of credit or cash-wire financing. Once the payment is done the goods are shipped directly to the borrower’s customer. In some instances, they may have to be shipped to Meridian facilities. After the customer receives his shipment the payment is made directly to Meridian PO Finance company. Meridian will charge a small fee to cover the facilitation of the transaction. The balance is forwarded to the borrower’s business as profit. Focus: You need to consider going for a company that mainly offers PO financing. The process can at times be complex.It is therefore advisable to choose a lender that focuses on purchase order transactions. Response Time: You need to consider PO funding programs that will deliver the financing on time. If the company takes too long to respond or fulfill your requests your business risks losing lucrative opportunities. Experience: There are many PO financing companies coming up every day. New companies may not be in a position to handle complex transactions effectively. You should go for a company that has at least 2 years experience providing this type of funding. Payment Flexibility: Before you seek the services of a PO lender, you need to understand their payment options. Some companies only offer to pay suppliers with letters of credit. While this is a safe and convenient way to pay, some clients would prefer a simpler method like a wire transfer. Purchase order financing has many benefits. It allows you to leverage your customer, vendor relationships to get funding and manage your working capital. You can do all this without having to give up a large amount of equity in your company with other types of financing. You can get up to 100% financing against your receivables. PO financing takes a shorter time than loans from traditional lenders, which helps to ensure that you fulfill your obligations to your customers on time.